A brief tirade against that perennial affront, modernist architecture--and about as clever as the title. Most of this is the usual: the impracticalities of flat roofs and glass boxes, the uplift rhetoric of their designers, the unbuilt (and ill-built) buildings of Le Corbusier, the toney asceticism of Gropius, Mies and the uniform blinds/curtains/shades, the sterile office buildings, the inhuman housing projects, the white-walled conformity of devotees' domiciles--only delivered, this time, not in reproof or in jest, but with a sneer. 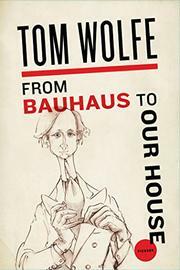 Wolfe's complaints are two: all of this is consciously, snobbishly "non-bourgeois" ("the spirit of avant-gardism in the twentieth century"); and it's un-American--i.e., unfaithful to "the Hogstomping Baroque exuberance of American civilization." First, insecure American architects rushed to the Bauhaus to study; then, camp-followers Philip Johnson and Henry Russell-Hitchcock heralded the coming of the "International Style"; then, in 1937, Gropius & Co. actually arrived ("uprooted, exhausted, penniless, men without a country, battered by fate")--and what did we do? We fell on our faces, made them heads of schools, made modernism the new gospel, downgraded Frank Lloyd Wright, outlawed apostates (like Edward Durrell Stone), and built those confounded boxes. Robert Venturi appeared, with Complexity and Contradiction in Modern Architecture (1966)--not to overthrow the non-bourgeois faith, however, but (with his camp historical references) to update it. And as for the Post-Modernists, that's a misnomer: they're still clustered in "compounds" (a basic modernist trait, allegedly--even Corbu had Iris brother) and still Boxed in. Short as it is, it's a tiresome business, virtually all spleen: to Wolfe, modernism seems to be a species of radical chic. But there will be readers--from among Wolfe's fans and those who still feel threatened by those glass boxes, even after 60 years.